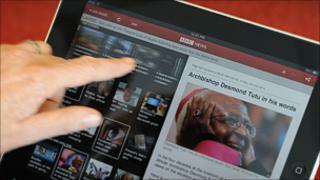 A BBC News app for the iPhone and iPad has been launched in the UK, the BBC has announced. The free-to-download apps for Apple products were originally due to be made available in April 2010. The UK launch was delayed while the BBC Trust, the corporation's governing body, assessed the proposals and their impact on the rest of the industry. Apps for other devices such as Android phones will launch later in the year. Similar apps for BBC Sport and iPlayer will also be coming soon. The apps do not "represent a significant change to the BBC's existing public services," ruled the BBC Trust, meaning that further scrutiny was not required. BBC Trustee Diane Coyle said that the body would continue to monitor the launch. Many news organisations already offer apps that give people a quick and easy way to keep up with events. Earlier in 2010, the Newspaper Publishers Association (NPA) said it feared the corporation would "damage the nascent market" for apps by entering the market with a free product. "The concern the newspaper industry has is that the survival of our big independent news organisations largely depends on them being able to make money from new platforms other than print," said Dominic Ponsford, editor of Press Gazette. "Mobile is a massive part of that and there is concern that the BBC could blow their fledgling apps out of the water by being such a dominant brand." However the apps market was a space that the BBC could not ignore either, he added. "The other side of it is that the BBC is also doomed unless it can embrace new readers on new platforms."